To see more of Shelley Metzenbaum's videos, visit the Center's YouTube Channel. Two simple tools - goals and measurement - are among the most powerful leadership mechanisms available to a President for influencing the vast scope of federal agencies. Goals and measurement are useless, however, unless used. Both Presidents Clinton and Bush undertook efforts to use performance information to manage. President Barack Obama has promised it will be on his agenda as well. What have we learned over the past 16 years that can help the Obama administration move forward quickly? This report reviews the lessons learned. 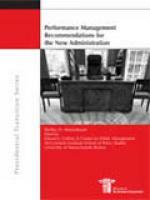 The author's premise is that performance information should be used to improve performance, not just report performance for accountability purposes. She offers a series of recommendations to the President, the Office of Management and Budget, new agency heads, and the Performance Improvement Council on ways to make performance information a vital element of success.